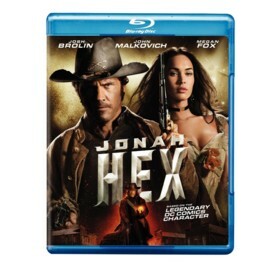 Jonah Hex is a Western movie starring Josh Brolin, Megan Fox, and John Malkovich. The movie was directed by Jimmy Hayward and released by the Warner Bros. Pictures studio on 2010-06-18. The movie has an MPAA Rating of PG-13 (Parents Strongly Cautioned). Our users found the overall impression of this film to be Pointless. The movie's official site can be found at www.jonah-hex.com. I recently rented a copy of this movie from my local video store. Based on other reviews I had read, I knew this would probably be a bad movie (which is why I used a free rental coupon :) ). I was hoping this would be one of those "so bad it's kind of good" movies, but unfortunately its just horrible with hardly any redeeming qualities. From some quick research, I found out that the movie is a real-life adaptation of a popular DC comics hero of the same name. Jonah Hex is a physically scarred former soldier. He was left for dead by a man named Quentin Turnbull who murdered the rest of his family. This "near death" experience gave him the ability to track anyone and surprisingly, even communicate with the non-living. Naturally, he wants revenge on Turnbull. In the years after the war he became a bounty hunter and racked up many warrants for his arrest/death. In a amazing co-incidence, the United States army needs Jonah's help to track and stop Turnbull, and in return for his services they will remove all the bounties that they have placed on him. The plot is laughable and is not believable in any way whatsoever. The acting is equally as bad. The titular character is played by Josh Brolin and I guess you could say he did an okay job. His "sidekick" Lilah (played by Megan Fox) acts slightly better than she did in the Transformers movies but that's not really saying too much. The setting is pretty interesting since not many Western movies and tv shows are produced these days, and the action is pretty exciting during some section. But overall, the story and acting were just too bad for me to enjoy watching this film. Rent it only if you are very curious, but otherwise avoid.